Does anyone remember the scones from Bleeding Heart Bakery in Chicago? They were so good. 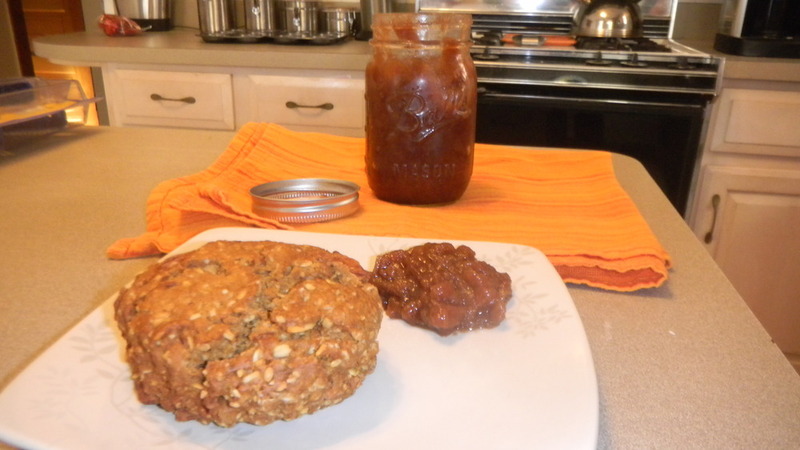 I featured them in a post where I made some apple butter to go with them. 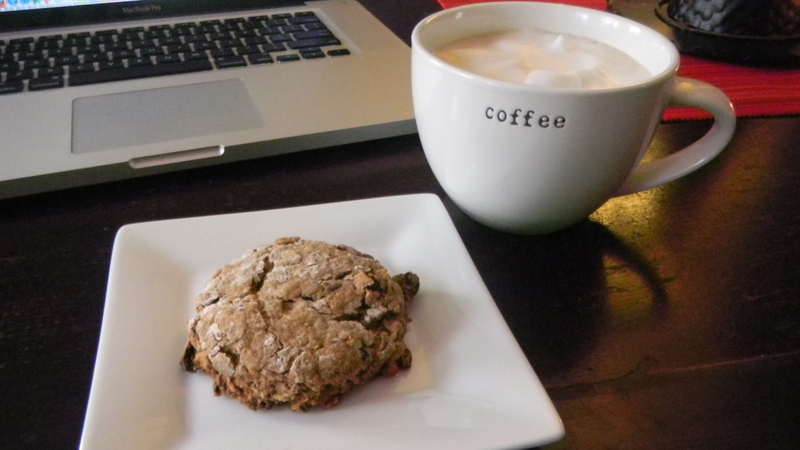 Seriously the best, most filling, yet oddly healthy scones I’ve had. Imagine my sadness when I found out that Bleeding Heart closed their doors. Was this scone gone forever? After doing some googling, I was happy to find out that one of the owners had given a newspaper featuring the bakery the recipe for the scones! I whipped them right up, and had a lovely weekend breakfast. Tip: Buy the dried fruit, pumpkin seeds, and flaxseed in the bulk section of the grocery store. That way, you can buy only what you need. I think I got more than enough flaxseed for about $0.80. Start by cutting the butter into smallish pieces, and freezing them for at least an hour. Next, stir together the flour, sugar, cinnamon, baking powder, and baking soda. 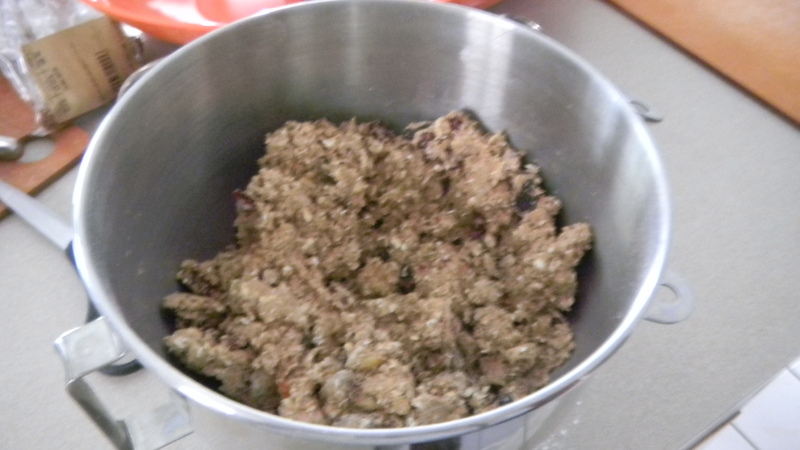 Add the frozen butter chunks in and mix until the butter pieces are about the size of a pea. Add the oats, fruit, pumpkin seeds, and flax seed. Stir until mixed thoroughly. Finally, add in the milk and mix just until combined. The mixture will be very solid, and not at all runny. 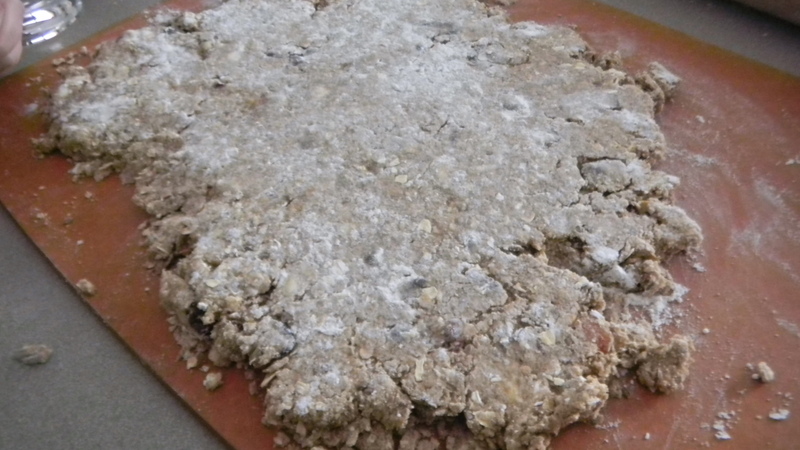 Roll the dough as you would for cookies, leaving the dough about 1.5 inches thick. 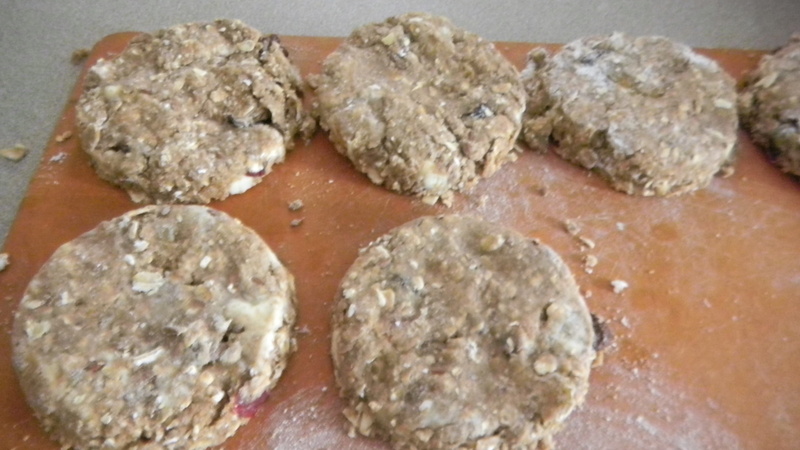 Use a 2.5 inch circular cookie cutter (or biscuit cutter, or even drinking glass), and cut out the scones. I repeated the process a couple times to get 13 scones. 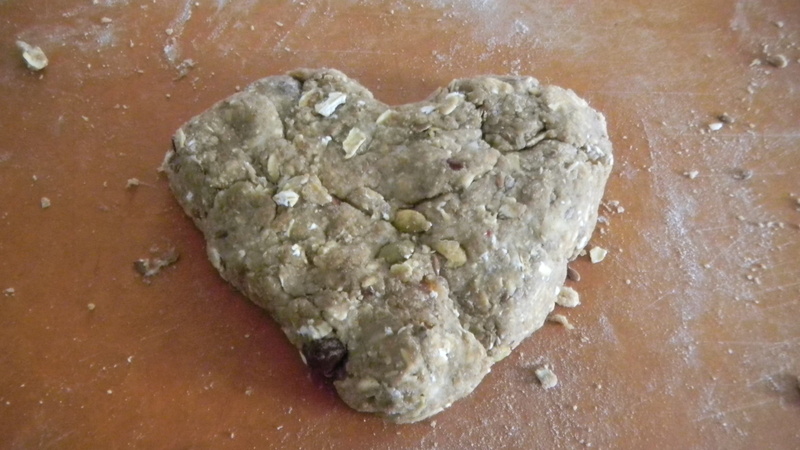 I used the dough I was left with to make one larger, heart-shaped scone. Bake for about 28-30 minutes at 375 degrees. Mine didn’t come out the same. They were very tasty, but I could tell they weren’t quite right. Still a great scone though. It’s October! That means I’m watching one thing: SCARY MOVIES! I’m a huge fraidy cat, so we keep the scary movies pretty tame in our house. 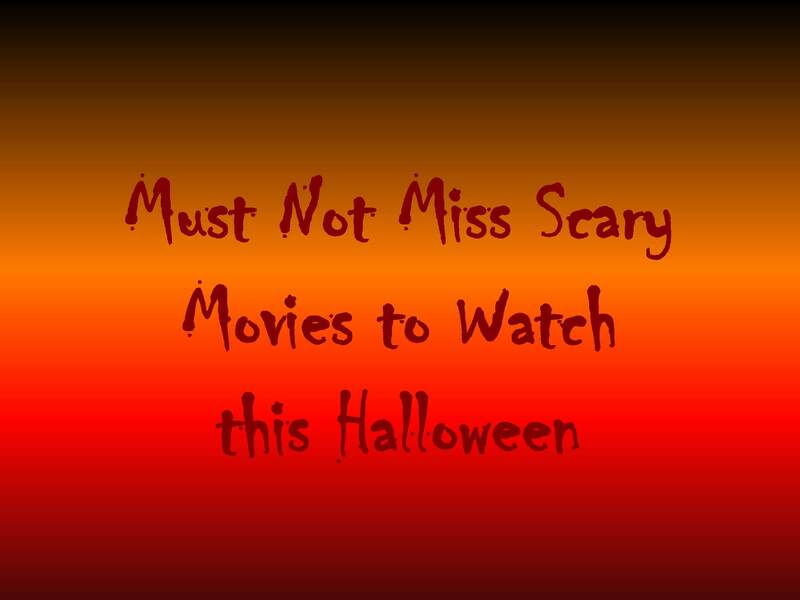 I’d say they’re more suspenseful than scary, and even kids’ favorites top my list of must watch movies this Halloween season. – Hocus Pocus: How can you not love three kooky witch sisters who try snatching children? – Halloween: The original. Still scares the pants off of me. He walks so slow and he catches you when you’re running. Freaky. – Psycho: Again, the original. Yes, we all know how it ends, but Alfred Hitchock takes the cake for suspense. Really, any of his movies work this season. – Night of the Living Dead: Yep, the original. Granted, you probably know all about how zombies work, but it was this movie that started it. – The Shining: I feel more unsettled by the movie every time I watch it. – Amittyville Horror: This time, not the original, but the one starring a seriously creepy Ryan Reynolds. – Paranormal Activity: Better for cheap small scares than giving you something disturbing to take away (like The Ring), but I still felt on edge waiting for something to pop out the whole time. – Scream (original, 2, or 4, but not 3): Just the kind of scary movie I like – you find out who the killer is and the murder spree ends. I never think Ghostface is coming to get me. I also really liked the show “Scariest Places on Earth” that aired on ABC Family’s 13 Days of Halloween when I was a kid. Though I haven’t watched those episodes since then, I remember it as being pretty scary. Of course, it might be terrible. Do me a favor: Don’t watch “Are You Afraid of the Dark?” as an adult. Total let down. So how do I watch these scary movies/shows? A number of ways (and yes, many of them are free or close to it). We have a subscription, so I just put all those terrifying tales at the top of my queue. The downside: so do a lot of other people, which makes getting movies like Halloween pretty difficult as you get close to the holiday. Sometimes, they add some older scary movies to their mix during October. Use a promo code and you have a free one-night rental. Instead of old school taping, just set your DVR to record some scary movies for you to enjoy. You can search by specific titles to see if your scary movie will be on anytime soon, or you can search the general scary movie category. I keep a few movies on my DVR throughout October and just watch them when the mood strikes. Usually, when I’m home alone, which always seems like a good idea at the time, but never is. Obviously, the movie will be edited for TV, but I think that’s better. No blood and guts! Head to your local library and see what they have on their shelves. My bet is they’ll have some old ones for sure. Better yet, reserve them online and they’ll be ready to go when you pick them up. Raid your friends’ scary DVDs. Switch amongst yourselves to see some movies you haven’t seen in a while. Or, host a scary movie viewing party and have everyone bring their favorite. Pick a few to watch in a row. Just be sure you finish the marathon before it gets too dark! I welcome any and all recommendations for additional movies to watch. Try to keep it a notch under terrifying though. I need my beauty sleep.